The field for the emergence of new sports competitions can rarely have been so fertile. Driven by the ability to deliver content to audiences through digital media, a desire to attract new demographics and the time pressure of both viewers and broadcasters, new formats have appeared with increasing frequency. To name-check but a few from traditional sports, the last twelve months have seen the announcement of the World Cup of Tennis, the ECB T20, the Hockey Pro League, Golf Sixes, the Laver Cup, the Next Gen ATP Finals, Tie Break Tens and the European Golf Team Championships (part of the new multi-disciplinary European Championships). In parallel, new sports in their own right have emerged as competitors to the established order, each bringing their own competition structure. Esports has been the most publicised, but parkours/free-running, drone racing, CrossFit and, less recently, X Games, are good examples of commercialised sports properties in new fields of activity. Typically, but not always, these new competitions are set up and organised by existing rights holders or by new rights holders in a “white space” distinct from other sports events. However, not all competitions emerge in a sport benefiting from a universal global, continental and national rights holder structure or with the blessing of established rights holders. In this regard, unsanctioned and unlicensed events will be discussed in the final section of this article. What is the form of contract? How can players move teams? What about player image rights? How do governing bodies exert control? The choice of structure is an essential preparatory step in setting up a new competition. It is not always given due consideration at the outset in the eagerness to select teams, organise and commercialise an event. In broad terms, the choice is a simple one between a contractual model and a shareholder model. In the former, teams or athletes operate by means of a contract with the event owner, usually a participation agreement or competition rules and regulations imposed expressly or impliedly through participation. In the latter, there is a system of shared ownership between teams and rights holders through equity held in a specially formed event vehicle. 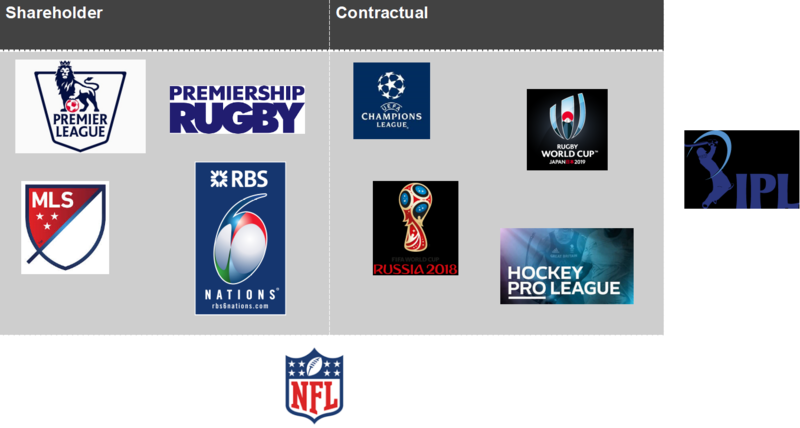 Examples of the contractual model include: the UEFA Champions League, the Rugby World Cup, the FIFA World Cup and the ICC Cricket World Cup. In this structure, the competition is typically owned and operated by the federation. For example, the Rugby World Cup is a World Rugby owned tournament. Teams do not have an ownership stake in the competition. A participation agreement may be signed between the federation and participating teams which serves as the basis for binding teams to the competition and governs all aspects of the relationship. This might be a stand-alone negotiated contract; or it might be a simple acceptance of tournament regulations. For instance, teams that qualify for the UEFA Champions League must sign the Champions League Admission Form 1whereby they agree to be subjected to the Champions League Regulations. operational considerations, such as responsibilities for different aspects of the competition and minimum standards expected of participants. To achieve a degree of separation from other federation activities, a separate legal entity may be established to operate the tournament (the consideration here is normally tax driven) or at least there may be separate disciplinary and officials’ units established to those already operated by the federation. There may also be a distinct competition board with participant representatives created to run the competition (this is not usually a board of directors in the legal sense but does allow different stakeholders to work together). Setting up a competition through this model is flexible and (in theory) quick and simple. It is sometimes used as a pre-cursor to a shareholder model while the competition is being tested, but beware the challenges of changing the status quo once an event has launched. It can be particularly useful if the teams in the competition often change – for example, qualification events, such as the FIFA World Cup, benefit from the flexibility afforded by this structure. Similarly, the contractual model is convenient and makes good sense where the competition is either a one-off or is held less than annually. It also allows the organising body to retain a high level of control over the operation of the competition, the exercise of rights and revenues. Examples of the shareholder model include: the English Premier League, the Six Nations Championship and Premiership Rugby. With this model, a new company is created to own the rights in and operate the competition. The shareholders will include the federation, participating teams and (if relevant) investors. It is possible to structure the share capital in different classes of shares differentiating between revenue shares and decision-making rights. The use of a special or golden share for rights holders is a common feature to give control, but not necessarily full economic participation – for example, The FA’s special share in FAPL (the English Premier League’s operating company). All these matters will require a shareholders’ agreement setting out rights and responsibilities. Particular consideration should be given to the mechanics for admitting and removing shareholders in order to allow for promotion or relegation or other changes to the teams. This would not cater for many of the matters for which a participation agreement or competition regulations are used in the contractual model (see above) and would, therefore, need to be supplemented by such an agreement or regulations. As with the contractual model, competitions set up under the shareholder model can have separate disciplinary and officials’ units to those already operated by the relevant federation. Unlike the contractual structure, the board is a board of directors in a true legal sense and would typically consist of participating team representatives (as a majority), federation representatives, independent non-executives, a CEO, chairman and (if relevant) investor director(s). Consideration should be given as to how a balance can be struck between the number of representatives likely to be requested by participating teams and basic principles of good governance on board size. The shareholder model encourages a high-degree of buy-in from participating teams through common ownership and risk sharing. It also allows for an obvious means of revenue sharing through distributions to shareholders. The English Premier League would cite a considerable part of its success as being a result of these positive facets of its structure. If you are acting for a participating team, the shareholder model will be appealing given the degree of control potentially available over the competition’s key matters (the English Premier League requires a special majority of 14/20 to approve material decisions). It also delivers the most obviously suitable structure for external investors backing the competition. Historically, sporting competitions may have been less obvious targets for private investment than teams. This is undoubtedly a product of most competitions having been governing body owned, controlled and funded. To generalise further, external revenues would typically be brought into a sport through the sale of commercial rights: a lucrative tv deal or title sponsorship, for example. The challenge brought by this approach is evident. It relies on the competition organiser having sufficient funds to establish the tournament prior to it becoming revenue generating. As noted, with the field for the establishment of new events (often not set up by an established governing body) ever more fertile, the organiser may need external investment to launch the event. On the other hand, investors may have an increasing appetite for funding competitions, not only (or at all) as a vanity project, but as viable investments from which they can derive returns from the value of the event and its rights. The recent reports that FIFA is considering approaches from investors for the revamping of the Club World Cup and an expanded Nations League illustrates that even the largest organisations may turn to external fundraising.4 For competition organisers not blessed with FIFA’s wealth, the impetus to fundraise is likely to be even more powerful. If external investment is sought, this can in simple terms come either in the form of debt or equity or a combination of the two (i.e. a loan or an investment for shares). We would speculate that investors in new competitions are likely to perceive at least part of the value as the potential growth in value as a whole of the competition, which would incentivise them to want to participate in the equity ownership of the competition. It follows that a shareholder model (as outlined above) will be needed. tax considerations for structuring the investment (from both the investor’s and competition organiser’s perspective) – for example, should funds go directly into the operating company or will a group company structure be used, and can it be structured to achieve EIS relief? What rights attach to the investor’s shares? Are they ordinary shares? Or do they have limited economic rights without full voting rights? Does the investor have a preference? Does the investor get a seat on the board? Assuming so, how many seats and what will be the overall composition / voting rights? What veto rights will the investor enjoy? Consider distinguishing between operational matters and financial matters. Can you drag along the investor in a sale of the business, and can the investor tag along with other shareholder in a sale? All of the issues above will require detailed consideration and documentation in a shareholders’ agreement and the company’s articles of association. In reality, categorisation as a shareholder or contractual model may be overly simplistic for some events. US sports have organised based on a franchise structure, which has been adopted in name, if not in substance, by other competitions such as the IPL in cricket and the Overwatch League (a professional eSports league for the video game Overwatch, developed and fully controlled by Blizzard Entertainment5). Is this a third way? The answer turns on the specifics of the franchise structure adopted. Our advice would be to dig beneath the label to identify the fundamental ideals of the model. It is likely that the franchise is not a franchise in the classic sense we associate with McDonald’s or KFC, but it may well provide an enhanced degree of operational autonomy, exclusivity and ‘ownership’ to the franchise teams when compared to a team operating under a simple contractual participation licence. In contrast, the IPL is more clearly a contractual franchise model with bidding franchises enjoying a package of contractual rights to operate and commercialise their team. In each case, territorial rights are usually awarded for exclusive territories large enough to cover major metropolitan or regional areas. While local rivalry is acclaimed in Europe, it is rare in the US (just two cities in the NBA have more than one team - Los Angeles and New York City). Financial reality dictates that a competition’s success will turn on its ability to exploit commercial rights successfully. But what are those rights? How are they split between rights holders and teams? And who will exploit them? We would urge a rights mapping exercise at the outset, both by horizontal category (sponsorship, media, merchandising, ticketing etc) and by vertical (competition, team, player). Having done so, it will need to be decided whether rights are owned by the competition rights holder itself or at team level and the degree of exploitation permitted. the inventory which teams can sell. What can appear on kit?8 What can appear in stadia? What about footage of teams (in practice and in matches)? What about digital assets? Protecting league partner exclusivity. Are there certain categories of sponsor which should be reserved to the rights holder for an exclusive central deal? Or is it accepted that team partners may conflict with central partners? Should rights be sold collectively or individually? The merits of each approach have been most heavily considered in the context of media rights,10 but apply equally to other commercial revenue streams. Certain streams, such as ticketing, hospitality and merchandise, may operate better on a local level. Due consideration of the impact of competition law on collective sales models should be given. We would urge a long-term view on the approach taken. The NFL and the English Premier League are presumably aspirational models for nascent competition owners and each approach sponsorship rights sales with a balance of carrot and stick. The carrot is a high degree of participation in central league revenues; the stick is a tight (and clear) set of rules on the types and scope of permissible advertising. We would also add that the role of commercial agencies, which are a feature of the sports landscape, should be considered. Their expertise and reach will almost certainly have a role to play for competition owners. The question from a legal perspective is how their role is structured. Are they genuine commercial agents marketing and selling rights on behalf of the rights holder (and, if so, what is their scope of authority)? Or are they resellers / distributors purchasing a book of rights for onward sale? In MLS, the system is centralised with footballers signing a standard contract with the MLS itself - a Collective Bargaining Agreement negotiated between the MLS and the MLS Players’ Union.12 Players are then allocated to teams under the League’s acquisition rules. Exceptions apply to allow teams to sign a certain number of designated players directly. 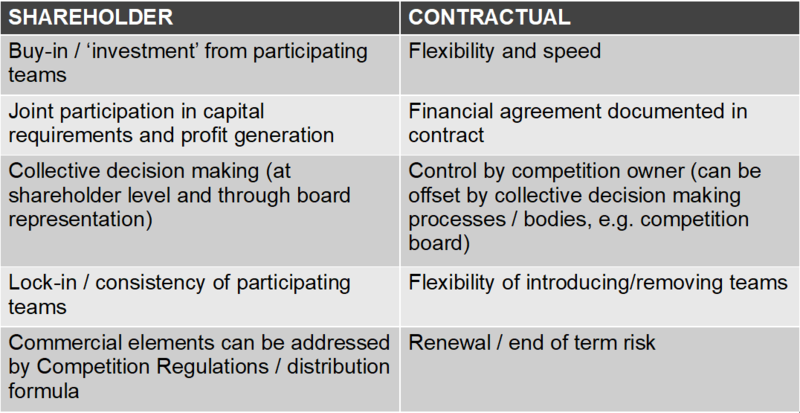 European sports have traditionally seen players contracting directly with the club, but central contracts have emerged as a means of securing players for a particular competition and controlling player appearances and welfare (and regulating some of the issues described below on player movement and salaries) in sports such as rugby.13 In a central contracting model, it is typical for the player, club and rights holder to enter into a secondary contract seconding the player’s services to the club. As noted, the MLS uses a collectively bargained standard contract. It is commonplace for rights holders to impose a standard form contract or mandatory terms where teams contract with players. For example, the English Premier League playing contract for football,14 the Rugby Football League Full-Time Player’s Contract of Employment, the Rugby Football Union’s Model Contract15 and the ECB Contract for Professional Cricketers. Will you adopt a draft system or a free-market transfer system (or a regulated version thereof)? This will turn on whether players are contracted centrally or by clubs. The MLS enjoys a high degree of control of placement of players at teams by virtue of the MLS holding the player contract. The excesses of the free market approach in soccer are well documented16 and the outcome has been for regulation of the transfer market by sports to varying degrees. Transfer windows, regulation of intermediaries, procedural rules and salary capping (of individual players or overall team salary) are all common features in sport worthy of consideration for a new competition. Athletes are the star properties of a sport. How can the competition and teams themselves enjoy those rights? There will need to be an express grant of so-called image rights by the player to allow use, which is usually catered for in the standard player contract. For example, the MLS standard contract makes provision for the MLS and teams to use player image. Identifying the participants in a new competition can follow various routes. It may be obvious that the incumbents will participate in the competition – for example, the relaunch of PRO12 rugby as PRO14 at the beginning of the 2017/18 season involved all existing teams plus two new South African teams in the competition.18 In other cases, participation is by qualification, in which case the rights holder is free to set the qualification process (having awareness for likely criticism of the format or qualification process chosen). Frequently, the path to selecting teams is less straightforward and involves inviting bidders for franchises19 or selecting a limited number of entrants from a larger pool of applicants. Particularly where incumbent teams may be excluded from a new competition, a robust tender process is recommended as a means of selection. The Hockey Pro League20 and The FA Women’s Super League are recent examples of this approach. Deciding on the number and identity of the teams invited to apply to participate. Is the tender open to all or closed to a select group? If closed, is there a two phase process where incumbents are first invited to tender, following which a second phase may be run if there are insufficient satisfactory applicants? Who will judge the tender process? This could be the governing body or an independent panel or a mix of representatives. It is best advised to find a balance between keeping control over the process, but also mitigating the risk of challenge. The aim should be to have a fair, transparent and non-discriminatory process, taking account of actual and perceived conflicts of interest. Fairness is plainly important, not least to mitigate any potential competition law challenge. The rights holder should take advice on structuring the process in a way that addresses any potential allegation of an abuse of a position of dominance by demonstrating that the ultimate selection is the result of proportionate steps taken in pursuit of legitimate aims. What are the selection criteria? Criteria can either be objective (a simple yes/no, such as minimum stadium capacity) or subjective (which requires human assessment and typically results in a graded score, such as quality of coaching). From a legal perspective, the more objective the criteria, the better, as it increases transparency and reduces the risk of discrimination. Subjectivity brings and increased risk of challenge under EU law. However, some subjectivity can be useful in preserving some discretion and flexibility. This means that the ideal solution might lie in a combination of both objective and subjective criteria, although this will depend on what matters most to the competition creator, having taken account of competition law considerations. How will selection criteria be assessed? Will they be assessed with a forward-looking approach, a backward-looking approach or a mix of the two? The advantage of the forward-looking process is that candidates are put on notice about what is required of them. Will you attach a pro forma participation agreement or other terms of participation to the tender? What scope is there for negotiation? From a legal perspective, the choice of name should be checked for potential trade mark infringement an early stage. Infringement can arise from the use of non-identical, but similar, names in a protected class. We think that consumer perception is decisive. From the examples of new competitions cited in the introduction, we can see that some do not appear very distinctive at all from existing trade marks – for example, World Cup of Tennis in principle cuts across FIFA’s trade mark, but of course the descriptive element of “tennis” and the different sport reduce the risk of confusion that this might be a FIFA sanctioned or organised competition. Better still, add a distinctive element (which does not infringe an existing trade mark) in the competition’s name: The Laver Cup, Next Gen ATP Finals and the Overwatch League, for example. A balance will need to be struck between the branding potential (and lower legal risk) of a distinctive name and the immediate understanding lent to fans by a descriptive name of what the competition entails. Don’t forget operational and logistical matters! Contracts will be needed for suppliers, service providers, venues, hospitality and travel providers/agents, ticketing and more. We would also flag scheduling as a critical concern amidst packed playing calendars and concerns of player welfare. It should also go without saying that advice should be taken on the structure chosen from a tax perspective, particularly where there is an international element or new corporate entities are being formed. It is beyond the scope of this article to consider these matters in depth, but they invite further consideration. those established in a “white space” with no recognised governing body (e.g. the Overwatch League). This section is concerned with unlicensed or unsanctioned sports events falling within category 2. There is no law that prevents someone setting up a competition outside the auspices of an established governing body. Governing bodies’ authority is consensual and does not automatically bite on parties outside their jurisdiction. History, commercial and political influence, and regulatory control and expertise place established governing bodies in a position of power against unsanctioned competitors. This power should not be viewed as a malign force and new competition organisers would be advised to consider carefully the benefits that can be delivered by reaching an accommodation with a sport’s governing body. Usually, co-existence can be achieved (see case studies below). It is likely that the reader will have some familiarity with the ISU decision23. We encourage reviewing the full decision (now published24). We can only touch on some of the salient considerations in this piece. The Commission decided on complaints brought by two Dutch professional speed skaters about the ISU’s eligibility rules. Under the ISU’s 2014 rules, a speed skater participating in events that are not authorised by the ISU essentially faced a lifetime period of ineligibility (later amended in the 2016 version to periods of ineligibility from an unspecified minimum to a maximum of a lifetime ban). The basis of the complaint was a breach of EU competition law, namely an infringement of Article 101 of the Treaty on the Functioning of the European Union and Article 53 of Agreement on the European Economic Area. The headline emerging from the decision was the Commission’s finding that the ISU’s eligibility rules did infringe those Articles and were, therefore, anti-competitive. Some of the reaction to the initial statement of the Commission foresaw a threat to the very existence of prohibitions on participating in unauthorised events. The forecast was bleak for governing bodies and a boon for athletes and unsanctioned competition organisers. Today's decision requires the ISU to put a stop to this infringement [the breach of competition law]. It could do that by abolishing its eligibility rules. Or it could amend them, so they're based on a clear list of legitimate sporting objectives, such as protecting athletes' health or preventing doping. We're not questioning that [pyramid] structure. And we're certainly not questioning the right of those federations to do their job of organising the sport. Of protecting the health and safety of athletes, and the integrity and proper conduct of sport. These comments fall far from declaring restrictions on participation in unsanctioned events to be outright illegal. If anything, they invite a reformulation of existing rules to ensure that they can have continuing effect; an overdue reconsideration, if you like, of current restrictions to ensure that they meet those age-old principles of EU competition law – the pursuit of legitimate objectives by proportionate means. Certainly, there will be an adjustment across the sector in time to calibrate rules with the Commission’s position, which may ultimately be more favourable for athletes looking for greater flexibility in their careers. However, it should be remembered that the case is fact specific and turned critically on the lifetime bans and lack of clear sporting justification, not illegality of the eligibility rules per se. The decision shows that if federations get their house in order in terms of setting up objective criteria by which to assess proposed independent events (e.g. rules protecting integrity, health and safety) then competition law will not interfere with their regulatory powers. We note above that an accommodation can usually be reached between established governing bodies and new competitions. The creation of the English Premier League under the continued regulatory control of The Football Association is a classic example. We hope that the list will help compartmentalise different considerations for new competitions, rather than overwhelm, and inspire you to invoke the spirit of Mark Twain in your approach. There will undoubtedly be other issues specific to each event. Do not treat this list as gospel but as a non-exhaustive checklist. If there is one overriding message it is this: lawyers should work closely with commercial and operational teams at the outset so that the event has the best possible chance of success. Too often, in our experience, structural matters are over-looked amidst the excitement of launching the idea leaving the door ajar to conflict and governance issues in the future. 8† Consider, for example, the reaction to the English Premier League’s recent decision to free up shirt sleeve advertising for teams to exploit. 13† For example, the Welsh Rugby Union and the Irish Rugby Football Union employ central contracts. 19† For example, the IPL and Overwatch leagues invite bidders for their franchises. 25† Ibid at Section 1(4). Jon provides commercial and corporate advice to clients. He is recognised by the directories as a “real go-to adviser” and a “commercial and regulatory expert”, with particular expertise on governance, corporate advice and commercial rights.